My last two EVAs have been focussed on collecting geological data. Nothing as exciting as testing and falsifying hypotheses (in your face Karl Popper!). Just the painstaking collecting of samples that will provide new data from which new ideas, even new hypotheses, may emerge. Much geological work is of this type – geophysical and geochemical surveying, lithostratigraphic and biostratigraphic work all being examples. In this case we are collecting soil samples of every colour change through the Brushy Basin Member of the Morrison Formation from just behind the station to the top of “Hab Ridge”. These colourful beds are a distinctive part of the local landscape. 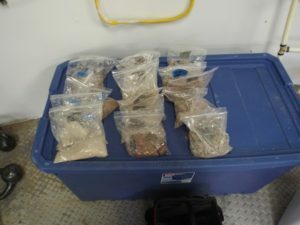 The samples will be sent to the University of Arkansas for geochemical and mineralogical analysis by one of our absent crew members, Paul Knightly. 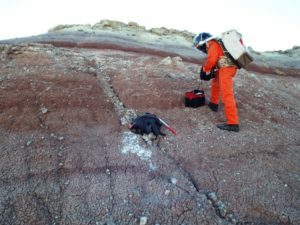 He will be joining us in the second half of the Mars 160 mission on Devon Island. In the mean time Paul is providing geological support for the rest of the team. What will the data show? We don’t know. 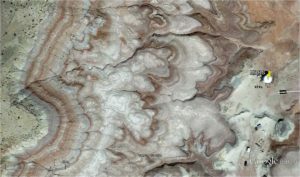 The colour changes are likely to reflect changing conditions during deposition and immediately post-deposition of the Brushy Basin Member. Examples include mineralogy, sediment type, sedimentation rate, degree of water logging, and volcanic ash inputs. We hope to see a pattern in the mineralogy and geochemistry that will help us discover these changes and processes. The data can also be used to ground truth remotely sensed data, such as from the ASTER sensor on the Japanese-US Terra and Aqua satellites. Similar changes in chemistry and mineralogy are likely to explain some of the cyclic sediments we see on Mars. Understanding how to read and interpret such patterns in remotely sensed data where we have ground truth will increase our ability to interpret similar patterns on Mars where we mostly do not have found truth. We are pushing back the frontiers of science, one sample and one step at a time.